A spectacular gathering of three of the brightest planets will be the chief celestial attraction in the evening sky during the next few days. Anyone with a clear and unobstructed view of the west-northwest horizon will be able to see Venus, Mars and Saturn in a single glance.? These three planets are destined to crowd into a relatively small area of the sky, making for a very distinctive and eye-catching formation that is sure to thrill most sky watchers. From my own personal viewpoint, I have been referring to this gathering as ?The Celestial Summit Meeting? to both members of my family and close friends. This graphic shows where to look to spot the planetary triangle on Aug. 5. A wide variety of different conjunctions and configurations involving the planets typically occur during the course of any given year. It is rather unusual, however, when three or more bright planets appear to reside in the same small area of the sky.? From our Earthly vantage point, we can readily observe Mercury, Venus, Mars, Jupiter and Saturn with our unaided eyes as they revolve around the sun. [Venus photos from around the world.]? Each of these planets appears to move against the starry background at their own speeds and along their own tracks. It is obvious that since they are constantly moving at different speed, the positions of all five planets at any particular time are unique to that particular moment.? All of the naked eye planets ? and the moon as well ? closely follow an imaginary line in the sky called the ecliptic. The ecliptic is also the apparent path that the Sun appears to take through the sky as a result of the Earth?s revolution around it.? Technically, the ecliptic represents the extension or projection of the plane of the Earth?s orbit out towards the sky. But since the moon and planets move in orbits, whose planes do not differ greatly from that of the Earth?s orbit, these bodies, when visible in our sky, always stay relatively close to the ecliptic line.? Twelve of the constellations through which the ecliptic passes form the Zodiac; their names which can be readily identified on standard star charts, are familiar to millions of horoscope users who would be hard pressed to find them in the actual sky.?? Ancient man probably took note of the fact that the planets ? themselves resembling bright stars ? had the freedom to wander in the heavens, while the other ?fixed? stars remained rooted in their positions.? This ability to move seemed to have an almost magical, god-like quality. And evidence that the planets came to be associated with the gods, lies in their very names, which represent ancient deities.? The sky watchers of thousands of years ago must have deduced that if the movements of the planets had any significance at all, it must be to inform those who could read celestial signs of what the fates held in store. ?Indeed, even to this day, there are those who firmly believe that the changing positions of the sun, moon and planets can have a decided effect on the destinies of individuals and nations on the Earth.?? Interestingly, 10 years ago in May 2000, and again two years later in May 2002, several of the planets gathered together in the western twilight sky. In their advance ? especially in 2000 and on much lesser scale in 2002 ? there were numerous astrological predictions of earthquakes, floods, wars and other disasters.? But despite all the ballyhoo, absolutely nothing happened.? So far as viewing this upcoming planet cluster, the only drawback for prospective observers will be that these three planets will be visible for at best for only about 60 to 90 minutes after sundown before they start getting too low to the horizon to be readily observable.? Astronomers measure the brightness of objects in the sky using a standard yardstick called magnitude. The lower the number, the brighter the object, with the brightest stars in the sky categorized as either a zero or first magnitude. So while Venus (dazzling at magnitude ?- 4.3) should be more than bright enough to see with the unaided eye in the fading twilight glow, Saturn (magnitude +1.1) and Mars (magnitude +1.4) will likely be a bit more difficult. Indeed, although Saturn and Mars are of first magnitude, they appear only about 1/150th as bright as Venus! Therefore, to avoid being disappointed, I would strongly suggest also using binoculars to scan the west-southwest sky for the three planets, especially if it is rather hazy (as midsummer evenings often tend to be).? Currently, Mars and Saturn as poised above and to the left of Venus. In fact, on the evening of July 31, Mars and Saturn were in conjunction, with the yellow-orange Mars passing less than two degrees to the lower left of Saturn. A planet trio is defined as when three planets fit within a circle measuring 5 degrees. 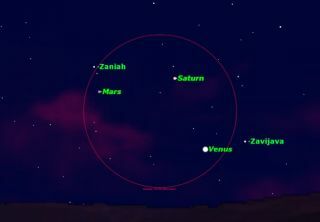 And on the evenings of Aug. 7-8, Venus, Saturn, and Mars will fit inside a 5-degree circle. Your clinched fist held at arm?s length, for instance, is equal to roughly 10 degrees; the pointer stars at the end of the bowl of the Big Dipper are separated by just over 5 degrees).? The angular diameter of the smallest circle containing these planets will be attained at 3 a.m. EDT on Aug. 8 (4.8-degrees), unfortunately when the planets will be below the horizon for North Americans. But on both evenings all three planets should be readily visible, standing roughly 15 degrees above the western horizon about a half-hour after sunset and not setting until more than an hour later. And their rapidly changing night-to-night positions relative to one another leading up to these evenings should be most fascinating to watch.? Finally, on the evenings of Aug. 12-13 a skinny crescent moon will slide well below and to the left (to the south and east) of the three planets marking the end of the summit meeting. Truly, that will be the cherry on this celestial sundae!? ?